FILE - Meng Wanzhou, executive board director of the Chinese technology giant Huawei, attends a session of the VTB Capital Investment Forum "Russia Calling!" in Moscow, Oct. 2, 2014. The charges against Meng Wanzhou are unclear. But Canada's Globe and Mail newspaper says she is suspected of trying to evade U.S. sanctions against Iran — something U.S. officials have been suspecting about her company, Huawei, for the last two years. A Chinese statement said Meng did not break any U.S. or Canadian laws and that Beijing expected Canada to "immediately correct the mistake" and release her from custody. 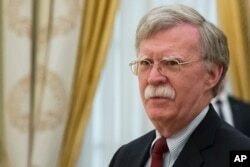 FILE - U.S. President Donald Trump's National Security Adviser John Bolton waits for the begenning of talks with Russian President Vladimir Putin in the Kremlin in Moscow, Russia, June 27, 2018. 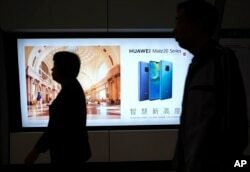 People walk past an advertisement for Huawei at a subway station in Hong Kong, Dec. 5, 2018. Canadian authorities said they have arrested Huawei's chief financial officer Meng Wanzhou.